Tonight’s Aberdeen v Motherwell game at Pittodrie was abandoned after barely eight minutes of play following a floodlight failure. The players first left the field after six minutes when parts of the ground were plunged into darkness, but returned around 20 minutes later when the lights were ‘fixed’. But the lights went out again barely two minutes later, after an apparent failure within the stadium’s emergency generator. 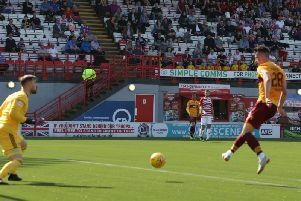 Motherwell supremo Alan Burrows told BBC Radio Scotland: “Unfortunately these things happen. “My main sympathy is with the Motherwell fans who have travelled all the way up here tonight. “We will look to try and do something. I know Aberdeen are going to let them back in (when the game is re-arranged) using their ticket stubs which is great. “And then the club will look and see what we can do in terms of travelling back up for the re-arranged game for the fans who have come here. Burrows said he felt that Motherwell had started the game well but he understood why it was called off. “I think the key is safety,” he added. “And it’s safety of the players first and foremost. “And safety of the people round about here in the ground. If you can’t guarantee the lights are going to stay on it becomes a lottery. “Players in terms of muscle strains and injuries, if you start and you stop then it can cause problems. “It was the right decision from Aberdeen and they made it fairly promptly as well. “These things are often unavoidable in the game and we just have to get on with it.